I’m a monster knitter. Now, when I say “monster,” I mean that I knit a lot. 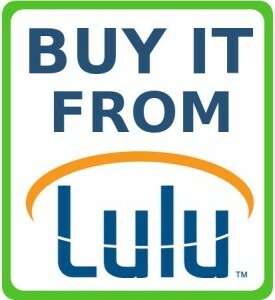 I know, this is a surprise to some of you, since I never mention it here on my blog. I’ve read some knitting blogs and they are great fun, but I’ve never really wanted or needed to write about knitting, until now. I did my first craft sale a couple of months ago. * This is the first time I’ve ever knitted things with the intention to sell them at a Christmas bazaar, and the whole experience was strangely humbling and personally risky. Why do I say risky? Because when I make something by hand, I spend a lot of time and effort on it, and I want people to like it. I hope they will think it’s nice; I hope they appreciate the work I put in. And it takes courage (at least for me) to display myself and my homemade crafts for all to see, in public. I’ve helped my dad sell eggs at the Farmer’s Market, but this was very different — much riskier. I wanted to have a table at the bazaar, however, because it was something I’d never done before! So, I had three baby sweaters for sale, which I had knitted over a year ago, and I spent about 6 weeks knitting mittens, toques and headbands to sell at my table. I made five pairs of children’s mittens using bulky yarn and a pattern that I had invented. I’ve created my own patterns lots of times, because, like I said, I knit a lot. I had traced my little friend James’ hand a while ago, so I had something to follow, but I was still anxious to have some real kids try them on. I hoped they would fit, but I wasn’t sure. I couldn’t wait for people to come by my table and try them on their kids. So, you can imagine how surprised and chagrined I was when the first toddler came by and the mittens were too small. They were way too narrow! They couldn’t get their chubby little hands into them! The cuffs wouldn’t stretch enough and, in most cases, they couldn’t even begin to get their hands in. I was so… discouraged, unhappy, frustrated and disappointed in myself. Here I thought I had made such great, warm mittens, and they were no good. Of course, I had to hide all these feelings and keep a good face on. When the doors to the craft sale had opened and people had poured in, I had to work through some anxiety — mainly because it was my first sale — but when I realized the mittens were bad, I was really rattled. I know, in some of my writing, I come across as totally confident and empowered (I generally am), but this was a whole new realm of personal territory for me. I had to pretend everything was fine, that I was a good knitter, and that this craft sale was just a fun adventure for me. I had to keep standing there, smiling, while people walked by my table… a few stopped and remarked at my cute baby sweaters, and I sold a toque and the two pairs of adult-sized mittens. I could sympathize with people trying to find the “perfect thing” for a Christmas present, but I was quite distracted by own thoughts. 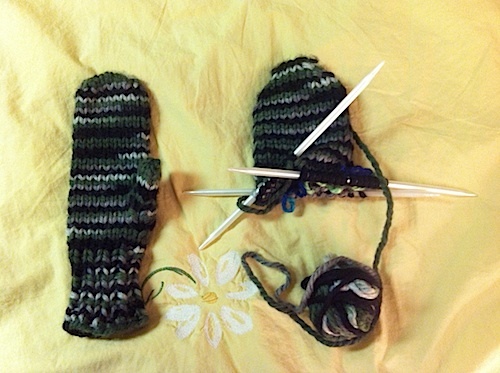 The too-small mitten is on the left… see how the one on the right will be wider when it’s done? This entry was written by Teresa, posted on January 25, 2014 at 2:40 am, filed under Encouragement and tagged hiding mistakes, knitting, mistakes. Bookmark the permalink. Follow any comments here with the RSS feed for this post. Post a comment or leave a trackback.